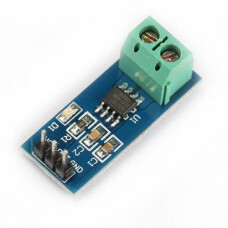 ACS712 Current Sensor Module - 20A can sense upto 20A of current flow. Sensing and controlling the current flow is a fundamental requirement in wide variety of applications, which includes over-current protection circuits, battery chargers, switching mode power supplies, digital watt meters, programmable current sources, etc. ACS712 Current Sensor Module - 20A is based on ACS712 sensor, which can accurately detect AC or DC current. The maximum AC or DC that can be detected can reach 20A, and the present current signal can be read via analog I / O port of a microcontroller or an Arduino.